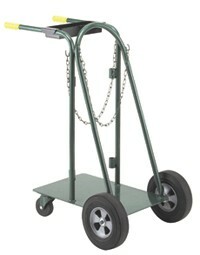 Four-wheel cart holds 2 standard 9" diameter cylinders. Equipped with 2 swivel casters and 2 large load wheels. Includes a removable tool tray measuring 12"W x 4"L x 2"D, 2 rod holders, and safety chains to help secure cylinders. Overall dimensions 21-1/2"W x 36"L x 40"H.